As the homeowner of a fixer upper, you generally have lulls in between projects. Mostly where you need to replenish funds from your last project and in some cases build up the mental energy to tackle a new project. My sweet son's room has been on the bottom of that list (for whatever reason for), well, basically since we moved in 4 years ago. I hadn't done much in the way of decor and finishing touches since he was 2, and even then it mostly consisted of a mirror hung on the wall (that he couldn't even reach to see). Every so often I threw an update in there with some bedding, a couple of nightstands and wall art above his headboard. But that's about where it ended. He even has an unfinished ceiling fan project that is just a major eye sore, that I swear I'll get around to at least once a week. So I finally said enough's enough and promised to finish off his main gallery wall to get his room a little more "put together." Up until now this has been about as good as it gets in there (pardon the low quality cell phone picture pulled from my archives). He's in such a sweet stage right now, where he's forged his personal interests (and boy is he PASSIONATE about them). First and foremost, above anything is his love of football. Most importantly the Dallas Cowboys. If you ever ask him about them, or anything football for that matter, you better grab a cup of coffee and settle in, because brother will talk. your. ear. off. Every library trip yields another book about the history of the Cowboys or anything other football book they may have (I know way more than I ever thought I would about Troy Aikman and Emmitt Smith). When he needs to unwind at the end of the day, he asks anyone in a 40 mile radius if they will play "tackle" or two hand touch. It usually ends in him trying to force his 4 year old sister to do it, to which she screams and it ends in tears after he's come at her full force with his helmet on. Point is, he loves football. So I knew I wanted to incorporate it into his gallery. Then I saw a pin on Pinterest (that she-devil temptress finally came through for me) for a 4 piece collage of his interests. It worked out perfectly for me, because he really does have 4 that sum him up quite well. First, duh, football. Second, legos, most importantly Star Wars legos (combining two passions in one). Third Xbox. Where he spends most of his earned Xbox time playing..... wait for it..... Madden (and Minecraft). Last, the other sport he plays himself, swimming. I couldn't help myself this past summer after one of his swim meets snapping his inner Michael Phelps. It took me about 30 seconds, I asked him to look at me real quick, and he posed himself! Enter my favorite little collage of canvases I think I've ever done. It sums my sweet 6 year old up in one glance at his bedroom wall. And although I know it will change over the next year or two I have a little time capsule of what he was like in this moment. I wish I had a picture of what this wall looked like before I stripped it down, or a better picture of it bare, but I had a million projects going on at once so this is as good as it gets. Before I took everything down it was a hodge podge of older decor ideas mixed with some place holders. I had to take everything down to clear my mind so I could start fresh with what I wanted. And honestly the only thing I knew to be true was, I wanted the 4 piece canvas collage and I wanted shelves. And that was it. I did a few mock ups on my computer for spacing and where I thought shelves would work, and then I just shopped around in stores and online for anything football related that wasn't cheesy or over the top (there was a ton of the latter). 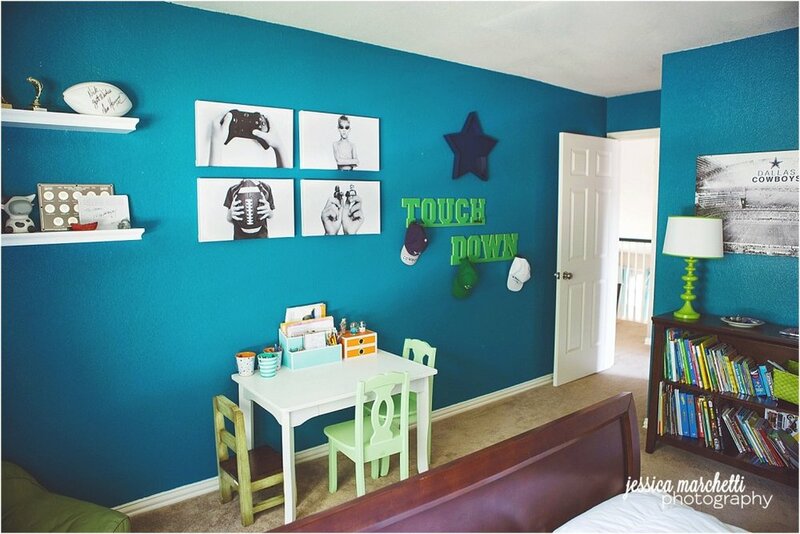 Once I got the shelving up, and found the cute star and touchdown sign I could finally order the canvases. I got everything hung and used masking tape to tape off the remaining space to see how much room I had left and chose the sizes based on that! Here it is bare (another bad cell phone picture). If you look closely you can see a bare ceiling fan light fixture.... that's brass... and missing a cover. That is scheduled to be spray painted and add a drum shade. Look for that in summer of 2028. And here it is after I hung the other pieces and measured the canvases using masking tape. The wall shelves were mostly because I can't stand clutter. And I promise you, he always knew where his little trinkets were at all times so there was no shoving these things in a drawer. 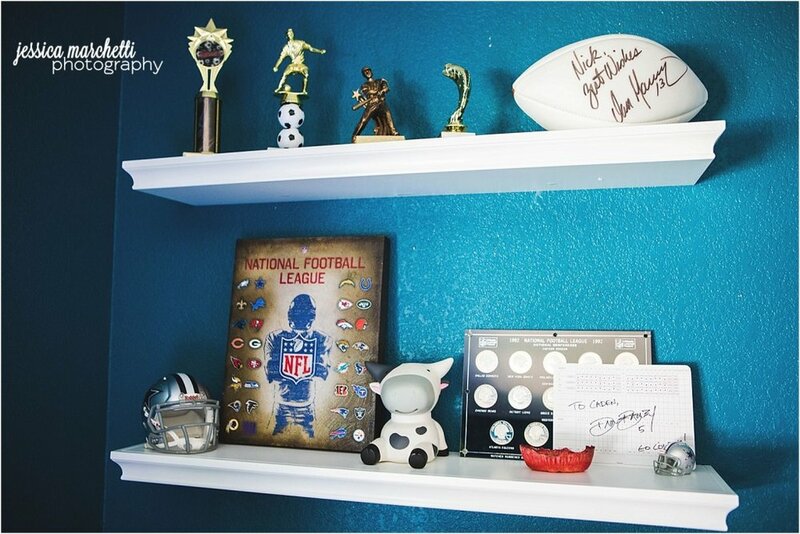 His two prize possessions are his little autograph from Dan Bailey and an autographed football from Dan Marino to daddy when he was Caden's age! And if you look closely, those football commemorative coins were also from when daddy was little. Caden FREAKED out when Meema brought those to him and are also proudly displayed now. One of these days I'll get around to getting him a proper sized desk and corner chair, but I'll take my victories where I can get them, and for now, it's that glorious wall! Touch down wall hooks from Pottery Barn Teen. White shelving, Dallas Cowboys and NFL Helmet art from Target. Dallas star from Hobby Lobby. They were being too cute coloring in his room when I tried to take these pictures real quick. So enjoy the cuteness of my two peanuts while you are here.